Controlling the temperature of your serviced apartment and facilities is essential to keep your customers returning and writing good reviews. Andrews Sykes energy efficient HVAC cooling solutions are designed by our in-house engineering team to meet your specific space under comfort zone. Recently, at a construction site in Dubai where some of the luxury serviced apartments are famous for, the contractors were struggling hard in peak summer for the finishing and hand over. As everyone knows, the final stage is especially challenging during the summer months if the chilled water supply to the building is not commissioned by the area district cooling plant. The high temperature & high humid climate adversely affects the interior fit outs, carpets, furniture and quality of work. 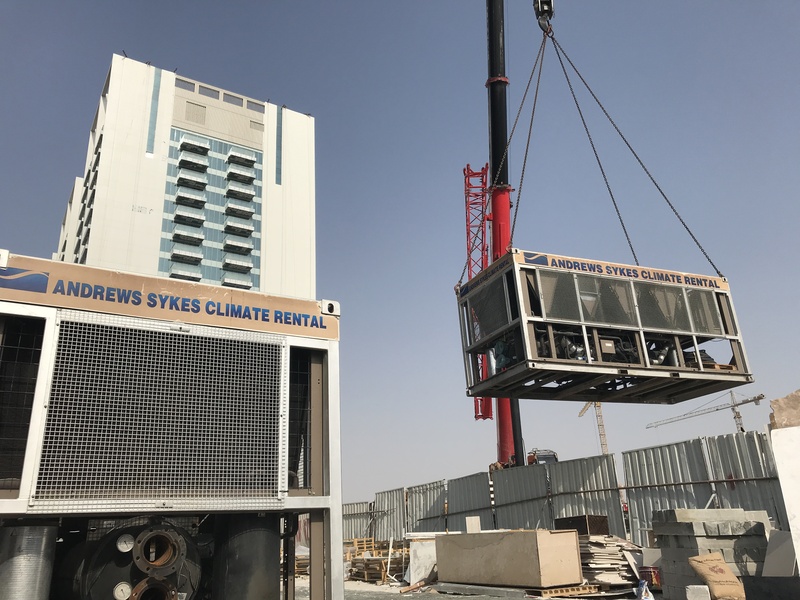 Due to the extreme climatic situation in UAE, Andrews Sykes Chiller hire team was called up to the rescue. After proper chemical flushing of the building chilled water lines, the 1.5MW cooling equipment were installed to provide comfort cooling for the workers and interior fit outs. The members of contracting company were overjoyed the solution provided by Andrews Sykes for this prestigious project. If there is anything you are unsure about temporary climate control or you have got a query that has not been properly answered, make sure you speak to our team of experts to get it clarified. Andrews Sykes welcomes you. This article was posted in AC Rental, air conditioining hire, Air Conditioner Rental, Andrews Sykes Climate Rental, chiller hire, Chiller Rental, Summer AC Rental and tagged AC Rental, AC Rental UAE, chiller hire dubai, chiller rental solution, Chiller Rentals, climate control, Climate Rental, cooling equipment, specialist climate control products, temporary climate control. Both comments and trackbacks are closed.